Two moments that changed everything in the life of west coast artist, Liisa Rahkonen. “As artists we have all been “cracked open” by unexpected moments in our lives; moments that have changed everything” relates multi media artist Liisa Rahkonen as we sit in her studio, high above Oregon’s wilderness coast. Originally an internationally award winning illustrator, who went on to a successful career in oil painting, Rahkonen is describing two such events that led to her radical mid-career switch to clay, and her commitment to genre busting ceramic pieces. My work is often ten steps ahead of my conscious life, and comes from some subliminal river that is constantly flowing…My first clay epiphany was a piece called “Buffalo Man.” I was painting Oregon coastal landscapes and going through a time of deep personal changes and ready for my work to more closely reflect the gravity of what I was going through. The Neolithic look of this piece was completely new and unexpected. I had little idea of what I was doing, where the form was going or how to technically construct the piece, standing as it was on four legs. Like the drawing of a dog with a human eye that I had done as a child, Buffalo Man stood as an animal avatar staring back at me with a distinctly slanted human eye. This piece gave me the chills when I pulled it out of the kiln, looking as if it were made from stone, covered with lichen, like it had been un-earthed from an ancient culture or from unknown places deep within me. This collection of bird and animal shapes, blended with human features, have textures and surfaces that suggest a primal and mythical root, using thick, chalky and cracked glazes to create an ancient-feeling skin. Many cultures believe that animals embody an essence, and by observing and tapping into that power, one could use the animals characteristics to impel deep spiritual and personal growth for inspiration to shape one’s own life and world. The fusion of animal and human shapes taps into the primal instinct that all life is one, derived from the same source, and is transformational. Rahkonen’s second “aha moment” happened in 1999 when she awoke from a vivid dream. In my dream there was a steep staircase, at the bottom of which stood a pair of boots covered in thousands of small glass beads with doeskin soles. I stepped into them and they fit me perfectly. Climbing the stairs I was guided into a room entirely covered in beads, pulsating with some kind of broad awareness from another dimension. I noticed that each bead was a point of light and that each worked consciously within the whole, while maintaining their individual strength and identity. I remember feeling as if I had just entered the heart of God. I woke up changed. It took Rahkonen seven years to process that dream though she thought about it daily. In 2006 she knew that she couldn’t express what she had seen and felt with paint on canvas, so she rolled out slabs of clay left over from her animal forms and began a series of ceramic boots. “The beginning was very important. My foot’s image in the clay… the full impact of the intention and the emotion I was holding evident there, both in the joy and the personal shadows. I worked very, very fast. I used to sew as a child and I understood that I could make a half moon shape to form the curved toe of a boot. I started slashing the wet clay and pressing objects and words into the surface of the sole and outer surfaces. I glazed them in a fawn leather-like color and then applied layers and layers of low fire glazes on stoneware clay body fired to cone 6. Hmmm, I remember thinking, wonder what this will do? The low fire glaze beaded up. I was very moved when they came out of the kiln, as the experiment worked and opened new possibilities. The boots embodied the memory of the dream. They represented a new direction, a physical manifestation of the dream. I often ask people: How do you tell your life story and then I show them that this is how I express mine. The metaphor and dense meaning in these new pieces resonated with Rahkonen’s clients and friends, and soon led to a series of west coast workshops titled “Boots for my Journey-Walking the Interior Path. 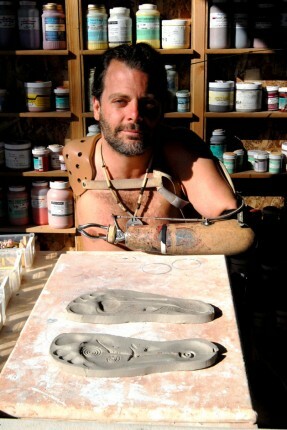 “I have guided many peoples feet into the clay, where their life experiences can take the form of these boots. In their hands the intangible becomes tangible. This creative process enables them, many for the very first time, to express to others the deeper meaning and insights of their “life’s walk.” This is a workshop for the joyful, and the brave. 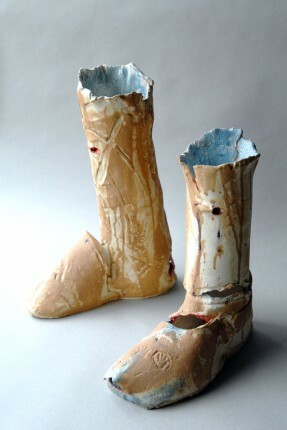 Student: David Maloney Boots: Glazed stoneware, pierced. 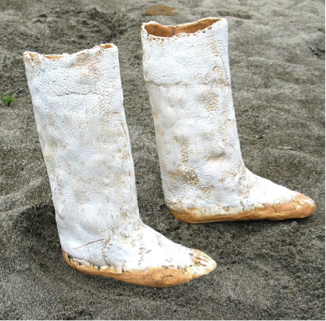 Although both the boots and clay animals are crafted with attention given to even the smallest detail, Rahkonen speaks of her finished work as if they are residual husks left over from the living process that went on during their making. It’s as if they emerge out of the kiln and quickly fall into her wake, as she moves forward swiftly into new work. All the inspiration, “the juice”, as she puts it, is contained in the meaning and excitement of what unfolds in her hands. The tactility of the clay, the careful prayer-like preparation of each material, the depth of experiences that she is there to convey. Since childhood it seemed that the actual process of creating art is an exciting kind of alchemy. I was fascinated to watch schoolmates swirl strokes of poster paint into bold abstraction, or to see how color and line could be organized into a giant tulip. Now when given the chance to watch my contemporaries work in their studios I am aware of this same magic as they synthesize raw materials, emotions and life experience into compelling works of art. I know of myself that I have an unquenchable desire to respond to life through art-making. For me this is a fusion of spirit, curiosity, prayer, contention, awe and love. Academic focus throughout my school years was a frustrating challenge while art classes opened my life into an infinite world of exploration through drawing, painting, papier mache’, clay, collage, printmaking and jewelry. This engendered a sense of purpose, and gave me an identity and voice at a young age. When I was eight, my twelve year old brother showed me invisible life on a slide under his microscope. I realized that the world of beauty was not only what I could see, but what I could not. I became obsessed with seeing everything microscopically and made volumes of detailed, colored drawings of shapes that looked and moved as if spawned from another planet. Thank you, Eric. My mother was always very supportive and instrumental in nurturing my creative spirit. When visiting museums she stood before a Winslow Homer painting, or a Picasso, or a Rubens and said very matter-of-factly, “Oh…you can do that.” My public school art teachers were extremely talented artists themselves. They enticed me with concepts that revealed a broad view of what art is, and encouraged constant experimentation. They provided books, films and a variety of media for the entire class. They challenged me. I enjoyed the struggle. Do you remember the first art works you did that you felt satisfied with? When I was about nine years old I discovered the combination of oil cray pas sticks, pencil lead and turpentine on paper. I loved the feeling of the dark pencil lines gliding through the oily cray pas, and liked the effect of how the pencil lines deepened in color and could be smudged out and drawn over. Using this technique I drew the head of a white Scottie dog and gave it the eye of a human being which was entered in the county fair. It was brought to my attention that a dog’s eye was a different shape than a human eye. I left it drawn as I had intended. It felt right. This may have been my first small rebellion. I see that your assemblages reflect a lot of the attributes of icons, yet they seem to have some modern and pop twists to their themes – can I ask about your goals in these works? I have always been fascinated with icons, apart from the religious content. The flat, carefully rendered faces and figures with the look of angst on the faces is very compelling. The emotional content of the painting combined with architectural elements in the elaborate framing of the piece is very exciting to me. I love the wooden hinged or silver tooled shadowbox effect of the richly ornamented icon. After returning from a trip to Paris with my family, this experience was manifest into a group of oil paintings and a series of contemporary icons. In particular, these icons reflect the eclectic atmosphere of Paris. My assemblages combine traditional images of angels, but they are presenting fine French food, candy and beverage on an altar. These shrines honor goat cheese, the fermented grape, the baguette, the honey bee, chicken, lobster, and chocolate; a commentary on the ordinary as sacred. For the endless walking done in Paris, I made a shrine to honor the “practical shoe.” These shrines are multi media constructions using wood, oil on canvas, handmade tile and clay objects, paper doilies, plastic animals, metal objects, and gold foil from Parisian candy wrappers. When the icon is painted and assembled it is covered with layers of hot wax encaustic and buffed to give the surface a lustrous sheen. This is an ongoing body of work. 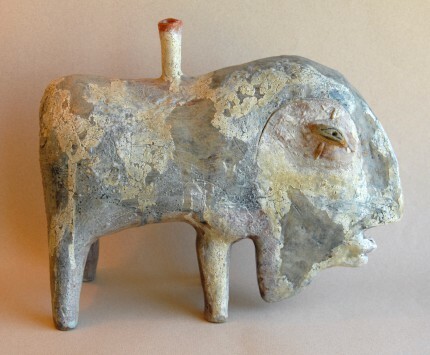 I see that your clay sculptures borrow themes from Neolithic, animalistic, and early ethnic origins – will you tell me about your reasons for this? The Neolithic content is a subconscious manifestation of my clay sculpture. A pivotal moment for me was when I made the slab built clay piece titled, ”Buffalo Man.” I had little idea of what I was doing, where the form was going, or how to technically construct this piece standing on four legs but it survived, nonetheless. Like my drawing of a dog with a human eye done as a child, “Buffalo Man” stood as an animal-like avatar staring back at me with a distinctly slanted, human eye. The sculpture gave me chills when I removed it from the kiln. It looked as if made from stone, covered with lichen, unearthed from an ancient culture or places deep within me. I see this piece as an unexpected teacher. What kinds of subject matter do you prefer? I am both stimulated and challenged by working with a variety of subjects and materials. The technical discipline required to paint a portrait is very different than the discipline needed to hand-build a clay form. Abstraction deconstructs literal material. This forces me to abandon much learned in art school, but to use the bones of drawing as an invisible reference beneath the painting. Painting a landscape calls me to pry beneath the surface of what is obvious about the place to uncover the spirit. The shrines offer me an opportunity to combine found and made objects together into pop commentary. These are all very difficult and separate challenges, but are a vital exercise for me as an artist to keep my work alive. 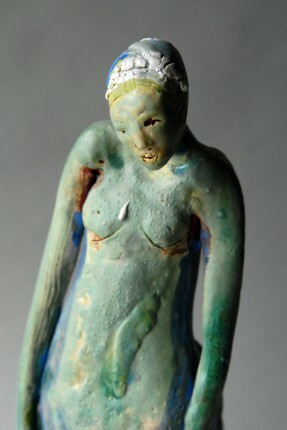 I continue to develop a body of clay forms that are rooted in spiritual intention. The process of creating these pieces moves me very deeply and I have only scratched the surface of possibility. Glazes are a universe to explore where I have much to learn. I hope to purchase a ball mill to grind objects gathered during a meditation walk. These powdered objects mixed into a glaze will cover my primitive animals in a skin of prayerful intent. Abstract painting calls to me. It represents facing the unknown and forces me into extreme discomfort where I leap off an edge with no net. I will continue to explore and develop layered scraffitoed surfaces using paintbrushes, sheetrock tools and sticks from the beach. I’ve noticed that my abstract paintings and animal sculptures have a very strong, direct relationship to each other. When placed together it’s like witnessing an intense conversation in an unknown language. The development of assemblages continues with several in various stages of development including a large scale shrine. My studio is littered with parts and pieces of handmade tile and miniature clay food strewn about as I work on these various pieces. My family. My dog. A mother who demonstrates that living life creatively is purposeful, and is also an endless source of entertainment. Living, seeing, breathing, motherhood, cancer, survival, folk art, light on form, shapes under a microscope, Native American masks, great public school art teachers, the vast Oregon coast, museums, my home, river otters in the bay, excellent food, music and friends. People who are committed to their passions. Native American healer, H’sa G’wntha Hokan Atuk. Unexpected opportunity. Tapies – for unspeakable beauty and simplicity, Louise Nevelson – for teaching the joy of discovering and assembling the found object, then painting it black. Degas – for bold composition, Salvador Dali – for turning my world inside out, Mary Cassatt – for painting,”Girl arranging her hair.” John Singer Sargent – for everything. Contemporary artists: Arthur Gonzales – for his outrageous surfaces and his piece, “The seduction of Madam Curie” and, Rick Bartow – for his compelling, brutally honest retrospective show at the Hallie Ford Museum. Have you gotten any interesting stories about exhibitions? One of my assemblages was chosen by the Art in the Embassies Program. “Madre” is constructed of plastic bread tabs cut, painted and arranged into the portrait of a woman, giving the effect of a Byzantine mosaic. It was encased in a Lucite box where it hung in the American Embassy in San Salvador, El Salvador for three years.